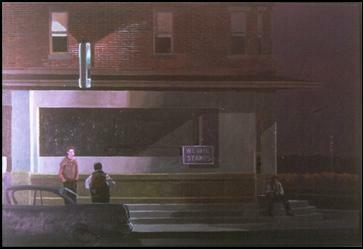 HISTORY: "On the Corner" Another painting that I would really like to locate is a portrait I did of my brother, Ray. I think it is one of the best pieces of my painting years and I regret so much for selling it. In 1970, I was taking studio painting classes at night to further my skills when I painted this canvas capturing this memory. These classes were mostly attended by people working on advanced units. This particular class was held in Ventura, and the lady who purchased it was a fellow classmate who lived in Westlake, CA. I have no record of her name but luckily I did photograph the piece. It's not the best photo and suffers from camera flash glare on both the left and right. To compensate for the glare, I cut two prints in half and put them together to get the best image possible.